The retail industry has changed dramatically over the past decade, thanks to the popularity of the internet, emerging technologies and the way consumers shop. According to Statista, global retail eCommerce sales are expected to reach $4.8 trillion by 2021. During the past key shopping days such as Black Friday, $6.22 billion was spent online in 2018 only on that day, which is an increase of 23.6% year over year. Every year brings new trends that will revolutionize the industry and challenge the eCommerce merchants. Your key objective is to follow the latest eCommerce growth statistics to plan and experiment with a marketing strategy for your business as well as adapt to new technologies and consumer preferences. We have prepared the list of top eCommerce trends for 2019 that will help you transform your business and leave the competition behind. The rise of multi-channel experiences has been marked by seamless transitions from mobile to desktop or mobile to brick-and-mortar and any variation in between. According to Forbes, Millennials prefer to buy products they discover on Instagram and Snapchat, that is why integration across channels is so important nowadays. You should also consider using platforms such as eBay, Google Shopping, Pinterest and Facebook which also support sales. AR allows consumers to see products in a whole new light and visualise them in a realistic environment. For instance, an app owned by IKEA allows users to display 3D models of furniture to show how it will look like in a specific place, such as customer’s bedroom or a living room. It definitely makes shopping easier and speeds up decision making process before the purchase. This powered by image recognition technology can match data points on any picture and get an exact or near-exact match. For instance, Google Images has a “Search by image” function that allows you find what you’re looking without using any words. Another example is a Style Match feature which is a mobile app owned by ASOS, that lets shopper take or upload a picture and the discover products from their catalogue to match it. Voiced based eCommerce lets consumers simply press a button on their smartphones and ask one the many digital assistants like Siri or Bigsby for whatever they want, including products. Without the need to type to search, it has become a game changers for eCommerce brands who now have to overhaul their digital strategies. The main consideration is knowing how consumers search when they talk and preparing the list of accurate keywords for your content. It is predicted that 85% of customer interactions will be handled without the need of a human agent by 2020. AI-based programs such as chatbots use machine learning to “talk” with users by residing on websites or applications at all times of the day. Chatbots are able to provide 24/7 support to the customers who need assistance, all without human presence. Is a way of delivering personalized content for your customers. AI based merchandising displays and promotes products by matching them with shoppers, who are more likely to find them relevant and complete purchase. For instance, if customers browsed a particular category, you can present them with similar products at the right time, in order to increase awareness of them and boost sales. Being available on multiple channels is important, but providing the same personalized experience on each platform is something you cannot leave unattended. You need to be able to recognise the same customer across all your channels to avoid offering irrelevant content. 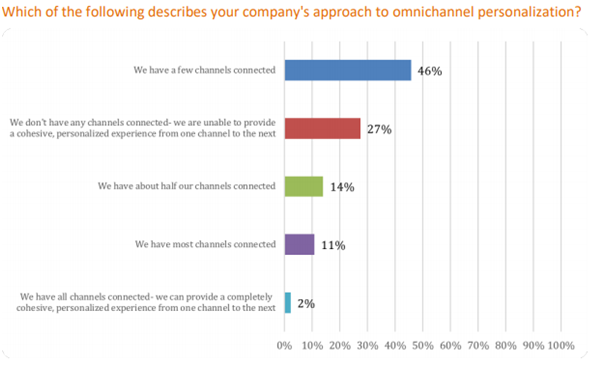 In fact, personalisation is proven to uplift in conversion rates by 93%, but only 46% businesses have managed to connect a few channels so far. Don’t wait and use this as a good opportunity to be ahead of your competition, providing outstanding customer experience. Order in the morning and receive it in the couple of hours? Same day or next day delivery as introduced by eCommerce gurus such as Amazon or ASOS, is something not only appreciated, but expected by many consumers these days. In fact, 72% of shopper revealed they would actually shop more and spend more if same day delivery was available. Subscription eCommerce has seen a significant expansion in the past few years, with 15% of online consumers signing up for subscription services in 2017. Users are constantly searching for new experiences and services that deliver new benefits along with personalised offers, that is why this trend is predicted to keep growing in the upcoming year. Rewarding your customers is an excellent way of expressing how grateful you are for having them on board and making sure they will come back for more after the initial purchase. A loyalty program ensures the users will keep buying from you, because for instance they can collect points that could be used up towards a future purchase. If your customers can gain something more from your brand than just your products, they will be more interested in doing business with you in the future. How to Promote Your Products Using Marketing..
Mailchimp Parted Ways with Shopify: Here’s What..
How to Create a Content Strategy That..
How to Increase the Average Order Value.. Your Essential Guide to Design an eCommerce..
5 Trends You Should Consider When Redesigning..
eCommerce Growth Statistics to Help You Plan..
What Types of Content Generate Demand in..
5 of the Best eCommerce KPI Metrics..
How to Optimise Your Shopify Store to.. Your Step-by-Step Guide to Setting up Shop..
How to Utilise AI for Your eCommerce.. Your Checklist for an eCommerce Mobile Website..
How to Increase Mobile Conversions with These..
How Digital Supply Chain Strategies Impact eCommerce..
What Is Conversational Commerce and How Does..
How to Plan for the Most Important..
10 Tips to Help You Increase Sales..
How to Pick the Right eCommerce Platform..
6 Important UK eCommerce Statistics to Help..
How To Choose the Right Creative eCommerce.. The Return of IRL Retail | Appear..
What you Should Know about Magento Commerce.. Luxury brand eCommerce – how to drive..
Grid-based design: Thinking grids in interactive web..
How endurable is fashion recycling for the..
Hospitality web design: essential UX tweaks for..
#UX / When are hamburger menus the.. Innovative product page designs that instantly engage..
6 annoying design mistakes that are turning.. Looking for a hipster Christmas eCommerce? Try..
Who’s winning the eCommerce battle? Amazon, Alibaba..
Digital marketing for coffee shops: A modern..
Menswear eCommerce: how to capitalise on the.. Still Invisible? Here is a quick SEO..
Magento Go to be Gone: How to..
Holiday excitement starts here: Excellent UX design..
How to boost your online sales? All.. Introducing Shopify Plus – New Premium eCommerce..
A Quick Guide to Successful eCommerce Business..